The government is to use £461m of its Olympic contingency fund to bail out two 2012 projects after they failed to attract private sector support. London's £900m Olympic Village will receive £326m from the £2bn fund, while two media centres, costing a total of £355m, will get an extra £135m. Olympics Minister Tessa Jowell said it was necessary to secure the projects despite the economic downturn. She pledged that spending on the Games would remain within the £9.3bn budget. "The Village and media centres are absolutely essential to a successful London Games with a real lasting legacy," Ms Jowell said. "With private sector funding now much more difficult to secure because of the global economic downturn, it is right that we take steps to safeguard these projects. "The extra funds we have allocated today come from existing contingency funds within the overall £9.3billion budget." Lower than anticipated construction inflation and good progress across the project had reduced risks, she said, meaning enough contingency funds remained. "We are determined to deliver the Games within budget," she added. Lend Lease, the Australian construction firm building the Olympic Village, had hoped to attract up to £40m in investments from the private sector. Plans included selling off part of the Village - the base for up to 17,000 athletes and officials - as apartments after the Games. But with investment slow to materialise, the government may have to dispose of the flats itself and take on the associated financial risk. Shadow Olympics minister Hugh Robertson said, given the immovable construction date for 2012, the need for contingency funds was "inevitable". "However, if a high-quality housing development, underwritten by the government, in a prime parkland setting, cannot secure any private sector funding, it does tell us that the economy is in a very bad state indeed," he said. Tom Brake, the Olympics spokesman for the Liberal Democrats, argued the media centre project should be abandoned. "It's time the Olympic Delivery Authority cancelled these plans for a grand media centre, otherwise London will be left with a huge white elephant." Earlier this month, the Olympic Delivery Authority admitted the economic downturn had threatened private sector funding for the Athletes' Village and media centres, but pledged the Games would not exceed its budget. 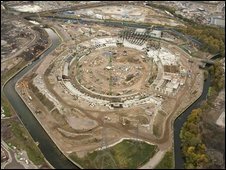 The 2012 Olympic site in east London will include an 80,000-seat stadium, the 17,500-seat Aquatics Centre and Athletes' Village. The original budget for the Games was £3.4bn but this was increased to £9.3bn in 2007.